When sophistication meets rustic farmhouse, the result becomes a charming kitchen in East Hampton. Designer Kelly Bailey of Coastal Cabinet Works knew immediately that the room should be unique, but not over designed. 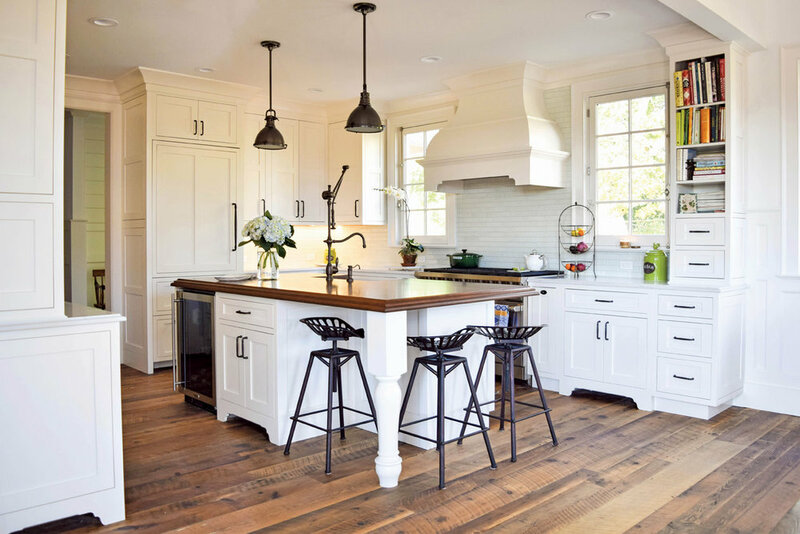 This main objective, combined with Truxel Homes Jeff Ulrich’s admiration for panel work, stemmed the idea of a farmhouse kitchen; the style being cohesive to both desires. With the aesthetic decided upon, the rest fell eloquently into place. Truxel Homes managed to find reclaimed barn wood from 1885 Pennsylvania, which was chosen for the flooring. Fieldstone Cabinetry’s unique shade of cream lends a luminous glow to the room. By centering a custom hood between two windows, Kelly was able to create a strong focal point. She also knew a bookcase would be the perfect addition to the end of this run; the colorful bindings of numerous cookbooks bringing personality to the room. The length of hutch cabinet serves as a statement piece, with glass upper cabinets reflecting warm light that floods in through the windows. Custom toe-kicks were artfully placed to lend a furniture feel to the cabinets. A hard working central island incorporates a dishwasher hidden behind a drawer and door panel, sink, wine refrigerator, waste pull out, additional storage and seating for three. The Grothouse cherry island top brings texture to the kitchen while tying in the flooring.